There has always been a female face to agriculture: the tough homesteader pioneering the frontier; the milkmaid; the tender of the flocks; the manager of records; the daughters and wives who pitched in with every chore known to farming, and helped keep it all together. Traditional attitudes however have undermined women’s contribution to the business of farming; ignored their history until it was virtually forgotten; restricted their access to resources; and have made them just about invisible. This is now changing. Many roles remain the same, but attitudes are evolving. For female farm owners (or the throngs of would-like-to-be’s), resources are opening up in the form of support groups, educational programs, and importantly, mainstream finance that has begun to recognize women’s impact, skills and reliability. Two key factors that will influence new gender trends in agriculture are women’s past financial disadvantage, and their interest in producing healthy, ethically grown food. According to the USDA, between 2002 and 2007 American farms operated principally by women grew by thirty percent. It was estimated that one million women ran their own operations and this year’s numbers are expected to be higher. This represents fourteen percent of American farms. These numbers are conservatively skewed however, as the survey listed males as primary owners even if the farm was co-operated with female partners. In Canada, surveys asked the question differently to account for both genders, and the number of women operated farms shot up to twenty-six percent. If the USDA posed their questions in a similar way, these numbers are likely to be reflected in the U.S. as well. This trend is driven by several factors: aging ‘boomers; developing financial clout of women; educational demographics; and the recent movement toward artisanal, organic, and/or local food have opened up new opportunities for women. Traditional skills and capabilities associated with women are also serving them well. Women generally take a more holistic approach to systems, with an interest in longer-term benefits for their families and communities. They are willing to seek and take advice, develop self-help groups, and manage finances more responsibly than their male counterparts. As we all know, in most of the developed world, women tend to outlive men. According to the U.S. Bureau of Labor Statistics, the average age of farmers is over fifty-five, and this trend is reflected in Canada. Farmers are aging and children don’t always take over the farm. The consequences are more women finding themselves inheriting the whole kit-n-caboodle. This applies to all types and sizes of farms, even cattle ranches and Big Ag commodity crops of soybeans and wheat, which are traditionally dominated by men. Another new trend is older men and women buying small farms to start retirement careers or to support themselves in an increasingly unpredictable economy (to many people, land and self-produced food are perceived to be more reliable than pension checks). As the longer lived partners, older women will find themselves running a lot of these farms. Lastly, with attitudes about women evolving within all aspects of life— including careers—daughters, as well as sons, are encouraged to take over the “business” as their parents age. However, buying—or keeping—a farm is financially challenging for anyone, but even more so for women, who have often been denigrated by banks wary of the unique “risks” of lending them money. Although slow to start, financial opportunities for women are beginning to expand and improve. Many banks and loan companies who have their “finger on the pulse” of trends now offer financing specifically targeted to women. Marketing has long understood the purchasing power of women, and marketing research has sought to know “what women want”. They have come up with a plethora of terminology thought to best capture female interest. Financial institutions use this information when forming product offerings to women. For instance, Bankers South offers loans to farmers and has a web page created especially for women. They woo “female farmers new to ag” with the promise of “that personal approach we hope will become a long-lasting relationship”. Personal approach? Relationships? Hardly phraseology they’d use to attract men. 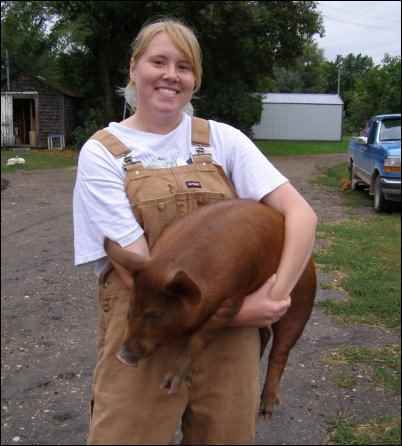 The USDA Farm Service Agency now offers loans to women farmers and ranchers. 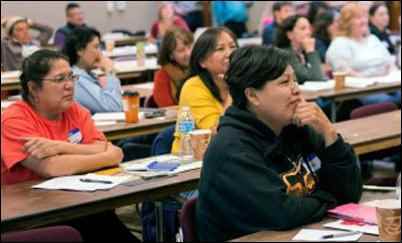 They list women as a part of a “socially disadvantaged applicants” group that includes African-Americans, North American natives, and other ethnic groups. However, the FSA hasn’t always been so open. Notorious in the past for its reluctance to offer farm loans to women and minority farmers, they are now looking at claims by both these groups and are offering cash or loans to counter past discrimination. Unfortunately, even though the FSA and financial institutions are beginning to recognize the value women bring to farming, women are still often disadvantaged. Equal pay for equal work is a relatively modern initiative, and generations of women working for less than men, often in ghettoized jobs, come to the table with less cash and collateral. This will likely continue to contribute to gender-inequality with financing for some time. So, unless you inherit the ranch or the soybean empire, what’s a woman to do? The answer: think small. The USDA Economic Resource Service 2013 report on the characteristics of women and their farms revealed the number of women farming increased compared to men (whose numbers were actually dropping), but most of these farms are very small, with annual sales less than $10,000. Five percent of woman-operated farms did have sales of $100,000. “These farms specialized in grains and oilseeds, specialty crops, poultry and eggs, beef cattle, or dairy.” The study also finds nearly half of women-operated farms in the U.S. raise some kind of livestock. So, there are women riding the range and managing large cash-crop operations, but most own small specialty-type farms focusing on organics, artisanal foods, heritage plants and breeds, horses, and hay. They are more diverse in what they raise than larger ventures. This is happening at the same time as consumers become increasingly aware of the shortfalls and dangers of the established food system. According to the Organic Trade Association organic foods have shown a consistent annual sales increase of 15% to 21% since 1997. That’s astounding growth and it benefits smaller specialty farms. Farmer’s markets, CSAs, and sales to local restaurants are great outlets for a small farmer who provides responsibly and ethically raised produce and meats to a growing number of consumers. It has to be said that local, organic food will probably never replace the super-sized, mechanized, centralized, bottom-line-is-God conglomerates producing most of the mainstream fare people eat today. However, the increasing demand for “real food”, ethically raised, is poking Big Ag in the side, and they are noticing. “Traditionally raised” meats, “free range” eggs, and branded “organics” now line the supermarket shelves. It’s women driving this demand with their purchasing-power, and it’s the growing numbers of small woman-operated farms that will provide a lot of the goods to this surging market. The agricultural field also encompasses many areas outside, well, the field. In Canada, Dinah Ceplis, International Program Gender Equality Officer, reports that in the recent past there has been a shift from generalists to specialists within agriculture extension services. “There are more women than men in animal/science/crop disciplines within the provincial government,” she says. In the U.S., more women than men are flocking to higher education and achieving more post-secondary degrees. In the near future, these female graduates will populate every professional arena, including agricultural services. HMI (Holistic Management International) Empowering Women in Agriculture Seminar Albuquerque, New Mexico. For those seeking to run their own farms, educational resources and self-help groups for women abound. Iowa State University offers education to farm women through Annie’s Project, which is listed as “an educational program dedicated to strengthening women’s roles in the modern farm enterprise”. Courses teach problem solving, record keeping, and decision making in twenty-seven states. Holistic Management International’s mission is to “educate people to manage land for a sustainable future”. In their Beginning Farmers & Ranchers Program, they provide education, mentoring and support for women in Texas and the Northeastern U.S..
Women are natural collaborators. 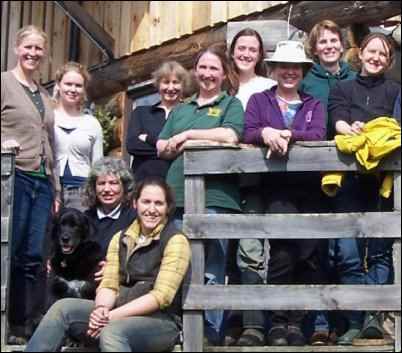 The Women, Food, and Agriculture Network (WFAN), is a group of women supporting each other in sustainable agriculture. They provide education and advocacy for holistic farming, and networking opportunities for women. American Agri-Women has been around for more than twenty years, advocating for women in farming on local and national levels. They also promote educational programs and leadership for women through scholarships, projects and training. With all the resources and support out there to redress past discriminatory practices and help women continue to, or begin, farming, one might wonder how we ever got into such a mess in the first place. Women have been credited by many anthropologists as having discovered agriculture, so what happened to turn the tables so dramatically? The answer isn’t simple. The transition from a hunter-gatherer society to an agrarian one doesn’t take a linear path through history. But let’s give it a shot anyway. The Paleolithic Age was a time when all people in the world were nomadic hunter-gatherers. Labor was divided along gender lines, although there’s evidence of some flexibility within these roles. Generally, women with children did the gathering, while older boys and men hunted. The average workday for men and women would have been very different. Men had the job of protecting the tribe from predators and outsiders. They occasionally took short excursions from camp, but otherwise stayed close to home. Hunting was done during monthly week-long treks to catch bigger game. They’d eat their fill, and then bring the remainder back to camp. Women foraged the surrounding area for small game, wild berries, nuts, tubers, herbs and fruit daily. 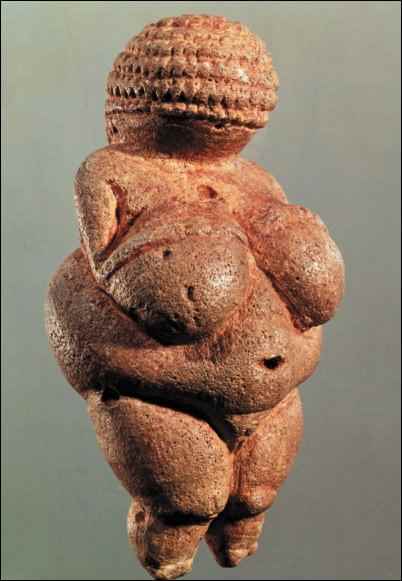 Venus of Willendorf, c. 23,000 B.C., is a sign of fertility and abundance the world over. Men provided twenty percent of the tribe’s food with hunting, while women brought in the remaining eighty percent. People in those days would have been intensely connected to their environment. They had to be: a shadow in the grass could be a sabre-toothed cat or a small game animal; berries and nuts could be poisonous or good to eat. Seasonal changes affecting herds of animals and the fruiting plants would have been well studied. Both men and women would have noticed that seeds passed through the guts of animals and sprouted in the manure left behind. Grasses growing from the droppings of herbivores roaming the plains, however, would have been less interesting to women than the berries and edible plants growing around their camp’s latrines and garbage dumps. Certainly these accidental plantings would have been talked about and taken advantage of. Fire was used as a tool by men to clear forest and tall grass so game would be easier to see. The resulting flush of edible plants growing out of the ashes would have been a boon. Women may have orchestrated some of these burnings to facilitate their foraging. It’s not known when the first woman decided to take some seed to plant along their migratory routes, but the late Paleolithic Age was the time our full understanding of the relationship between seeds, fertilizer, sun, and water was born. By the dawn of the Neolithic Age, about 10,000 years ago, permanent settlements began showing up throughout the Near East. No longer did these people follow the herds or the cycles of wild edibles; instead they relied on agriculture and hunting. Women planted groves of fig trees from branch cuttings. They developed planting tools, such as fire-hardened, sharpened sticks with rounded stones for handles. They utilized irrigation and fertilization to plant the first peas, herbs, vegetables, tubers, bottle gourds, grasses and early forms of grain. With these they produced food, medicine, and beverages; as well as materials for weaving ropes, nets, mats, and baskets. Life was no easier for these people than it was for their ancestors, but it was a little more secure. Women still provided most of what the settlement ate. They’d learned that fire-hardened clay would make pots to keep seeds and food safe from rodents and insects. They knew how to cure, dry, and preserve the harvest for the lean times. They conscripted their children to help with weeding and protecting their crops from wild goats and sheep. Men hunted for wild game, but agriculture was the domain of women, and much of the group’s religion was centered on this relationship. The cycles of the moon, so important in the timing of planting and harvesting, corresponded with the cycles of their own bodies. Fertility of the earth was now well understood, sacred, and deeply connected to women. Goddess worship was prevalent, and women enjoyed respect and equality with men that was unsurpassed at any other time in human history. By the end of the Neolithic—some five hundred generations after our Paleolithic heroines made the association between seeds, fertilizer and soil—a thriving town of two-story mud and beam houses crowded the shore of the Danube in what is now Romania. Writing was in its infancy. Grand temples had yet to be built. But the groundwork for modern civilization was firmly in place and a major change in the status of women was on the horizon. Danube culture still recognized women’s contribution to agriculture and society, but roles were beginning to shift. Wild game had become scarce around growing settlements, and domesticated sheep and goats had been conscripted to replace them. Since they no longer provided the main source of meat from hunting, boys and men became more involved in agriculture. They took care of the larger herds, and women began to look after the smaller animals. With the invention of the plough—and the domestication of oxen and other animals to pull them—agriculture evolved to sustain larger populations. Men were fast becoming the producers of the high-carbohydrate grains that had become the staple food people now ate. Once civilization began in earnest—with expanded trade routes, copper smelting, and creation of early textiles—commerce and trade became the driving force behind growth, and women’s roles became more devalued and restricted. Until this time most people still traced their lineage through the female line and agricultural land was largely communal. Original settlements were more egalitarian and private property was an unknown concept. Related people used to make up an entire tribe, but now there were many smaller groups living within larger populations. Over time, men began to compete with each other more than against predators and outsiders. The people to benefit from this competition were close relatives. Although extended families living together was not new, their importance as political units began to grow. The commerce made possible with stable communities and reliable food sources created wealth, but not equally. In the growing hierarchal societies, access to prime land began to be claimed by larger, more influential families. With men’s status advanced through this new social system, patriarchies (and the beginning of class systems) began to be the norm. Fathers now arranged their children’s marriages to best advance the family’s position, allying themselves with trading partners or to curry favour. Women came to be viewed more as property than equals. Land now passed from father to son. Cultural shifts generally occur slowly over time, with occasional spurts and diversions along the way. Environment, technology and population growth all affect how cultures evolve. There wasn’t a time when men got together and plotted ways to take power from women. The loss of status would have been so gradual, and supported by seemingly advantageous and logical rearrangements of gender-assigned labor, that few would have noticed the change. History is reborn with each generation who grow up thinking their reality is the “norm”. Today, women all over the world farm. In the developing world they still provide the majority of food for their families and communities. The difference between the lives of these women today and those of their deep ancestors is in respect for what they do and their status in society. We in the U.S. and Canada place value on having basic human rights protected, including gender equality. Although women have had difficulty in gaining recognition for their contributions to farming here, we should remember that we are still far ahead of much of the rest of the world. And we’re rapidly gaining ground (pun intended). All that said, the new feminization of agriculture in North America will not be a continuation of “business as usual” with female heads of conglomerates taking over from men. Certainly some of that will happen, but the majority of the change we’ll see in the near future will be in the types of food we eat and how they get to market. The importance of local, real food grown on smaller farms will continue to build, offering women a growing opportunity. And who knows? Female ingenuity may discover ways to decentralize our current distribution channels, at least for meats, produce, honey, eggs, and a myriad of specialty and artisanal foods. Picture local networks of cooperatives surrounding cities and towns, giving people back their right to access diverse, wholesome, sustainable, and ethically grown food. Then picture the farmer providing this wholesome food, and you’ll likely see a woman in overalls, pitchfork in hand, working hard to create a better tomorrow for herself, her family, and you.